The Opel Corsa Automatic is an affordable and practical car that's well worth a place on any supermini shortlist when it comes to finding the best car rental options in the area. It brings with it the perfect blend of comfort and familiarity while also bringing in a touch of exotic flare and luxury. The vehicle is made to handle well in any weather conditions and is a great way to get out and see the sights or get to wherever it is you need to go. With seating for 5 and the standard 5 door layout you can easily enjoy all the amazing features while staying comfortable from the beginning of your trip to the very end. 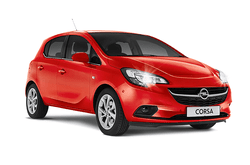 Check it out today and see why the Opel Corsa Automatic is a popular choice for car rentals today!